Continuous Lobbying efforts on the part of large employers have prevented sorely missed revision of laws, protecting American workers from age discrimination. As the baby boomer generation is progressing through the years, a significantly larger number of qualified workers find themselves laid-off and without future employment opportunities. Sinking such a large class of people (the number of living "baby boomers" is estimated to be 70-80 million people) in a deep sea of unemployment would have a detrimental effect on our economy and put a major burden on younger people who will need to pay taxes and support their unemployed parents. Clearly, without changing the existing legal framework covering the layoffs of older employees, due to the level of their salary alone (which is considered legal today), there will be hell to pay in the near future. Former Sen. Tom Harkin from Iowa while he was still serving in the U.S. Senate, attempted to pass legislation that will effectively overturn the Gross ruling and place the ADEA on equal footing with Title VII with respect to “mixed motives” cases. The Protecting Older Workers Against Discrimination Act (POWADA) proposed to allow ADEA plaintiffs to prevail in “mixed motives” cases as long as these plaintiffs can show that age was a “substantial motivating factor” in the employer’s adverse employment decision. The proposed POWADA has been "grinding water" in the U.S. Senate for years (most good legislation is known to die there) and consequently it might take a while before it passes, if ever. While passage of this act will not prevent employers from firing older workers due to their higher pay, it will prevent employers from discriminating against employees (based on their age) with impunity, in cases where those employees happened to be paid more. The effect would be similar to the Lilly Ledbetter Fair Pay Act, which addressed and corrected the Supreme Court’s distorted interpretation of Title VII. Our only hope is that POWADA or similarly proposed (bi-partisan) laws may address and correct the distortions in the interpretation of the ADEA. Please be proactive for the sake of our future and our children's future. The Intel Eliminati are hosting an open Hillsboro High Tech Job Fair. It will be open to any and all High Tech workers. For Hardware, Software, Materials Science, EE's, Program Managers and other job seekers with extensive High Tech experience. Tickets are available thru the Eventbrite registration system. While conducting my employment discrimination research project over the last 13 months, I found out that besides filing for administrative law hearings and judgments with State agencies (like BOLI in Oregon) and the EEOC Federal agency, as well as filing an individual civil law suit, there are additional options for employees to seek justice. While the term "Class Action" is quite well known and employers (including Intel Corp., Google and Apple) have been successfully sued through class actions suits, there is an additional option, which is referred to as "Collective Action". Since I am not a professional attorney, I prefer to leave it up to you to understand the significance of a Collective Action. What Is a Collective Action Under the FLSA? 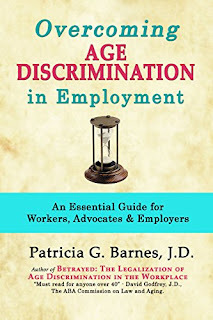 "Overcoming Age Discrimination in Employment"
I already ordered a paperback copy through the Tigrad, Oregon cooperative library. 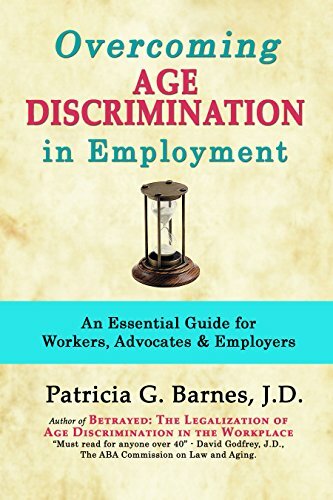 The book is very new (published in January of 2016) and therefor covers all the latest aspects of treating age discrimination cases under existing laws and court decisions. If you are 40 years old or older and have any reason to believe that you have been discriminated by your employer, due to your age, I urge you to immediately file a complaint with the State agency that is responsible for enforcing Civil Rights in employment in your state (BOLI in Oregon, Department of Fair Employment and Housing (DFEH) in California, Human Rights Commission (WSHRC) in Washington State, etc. ), as well a the EEOC. In most cases, if your complaint is accepted by your state agency within 180 days of alleged violation (or 300 days in states that provide anti discrimination in emplacement laws), the relevant State agency co-files your complaint with the EEOC. Otherwise, you have to immediately contact the EEOC and file your complaint directly with them. I offer to conduct educational classes on the subject, if there are enough people interested in pursuing the Administrative Complaint process. Watching the crowd in a park on a lazy summer evening, stumbling thru looking for Pokemon Go, there seems to be several business opportunities at Gym's and other locations of interest. Set up an Ice Cream Stand! Set up a Souvenir and Cell Phone Charging Station! That's just some semi-Legal ideas. I'm sure there are other more less-legal business opportunities awaiting enterprising individuals. For instance, what would be the ROI on pickpockets and purse snatchings with such large groups floating by? And what about the flesh industries? Silicon Chip Verification Outside of Intel Corp.
A large number of our members have been involved in silicon chip verification at Intel Corporation, before they were laid-off. It is quite clear now that Corp. management, with their lack of vision regarding how the expand the market for the company products, decided to take the risk and cut down on product electrical and functional verification. However, the chart below demonstrates that as the move to denser silicon chips is expected to take place over the next decade and beyond, the functional complexity of the product, as well as the software needed to support the end-user functionality of the chip are expected to grow exponentially. The demand for verifying the IP design, as well as verifying the electrical and functional behavior of the silicon implementation are also expected to grow exponentially, due to the same complexity factors. From my point of view I can see a lot of opportunity for new startup companies to take over the execution aspects of new silicon chips verification (particularly electrical and functional verification) therefor freeing the large silicon vendors to focus on their main lines of business. This situation could even be accelerated as more "fab-less" companies produce IP with smaller on-board staff. Smaller, agile and independent companies can execute the verification job a lot more efficiently than the top heavy department of a large company, which are constantly mired in internal politics, as well as conflicting directions. I predict that Intel Corp., as well as other companies will begin outsourcing their product verification projects to outside vendors who specialize in this field. Perhaps there are opportunities for some of us if we prepare for the future, open our horizons and pursue the opportunities that the market presents to us. I suggest to watch the following video, demonstrating that silicon verification jobs are sorely needed in the silicon industry and unlike at Intel Corp. smaller scale projects are plentiful. As usual, please submit your response through the comment link below the article. This Web Site Coverage Applies to Ex-Intel Employees All around the U.S. Since questions that we receive from time to time, mostly via email, indicate that there is ambiguity about the locality of our web site and the activities which we support and promote, we would like to clarify our position. PDX-TIE.ORG is a nation-wide web site. This web site coverage applies to Ex-Intel Employees who are located all around the U.S., regardless of the circumstances of their separation from the company. Though we began our physical meetings and other support activities around the Hillsboro and Portland metropolitan areas in Oregon, our web site is not physically bound to any specific State or geographical area -- everyone is welcome to keep in touch with us, submit articles to our editors and comment on the content presented throughout this web site. Business Opportunities on This Web Site? Several people approached me via email with a request to use this site for promoting their new startup businesses. All requests came from ex-Intel members of our group who share our common situation. At this point I hesitate to modify the nature of this web site in a way that will not be compatible with our goals. However, at the same time I would like to give our sisters and brothers the opportunity to "plug" their new startups to our constituency. I would also like to allow people who have business ideas and who are searching for partners to join them, to place their "wanted" ads on this site. This is all new and therefor we need to mull it over for a few days. We may be able to start a small scale experiment within a short time, once we understand our audience's needs. We would need your input regarding the above and we are looking for your comments. Please click on the comment link below the article and share it with us. Several news articles began covering a subject that went missing from public debate for a very long time--namely, age-based employment discrimination. While the need for diversity in the corporate world began gaining grounds over the last few years, it is apparent that it is viewed mostly, as a matter of gender inequality and ethnic minority representation. 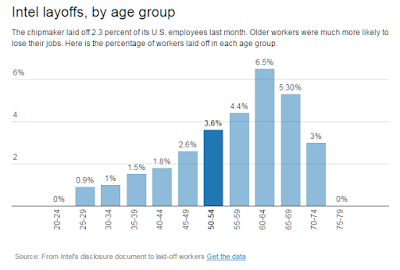 For some reason, the word diversity, as used in most discussion abut the workforce composition, particularly in the "high tech" industrial sector in the U.S. ignores the issue of age balance. It is hard to believe that the well educated workers being employed by high tech companies are considered disposable, once they reach the "ripe" age of 40. 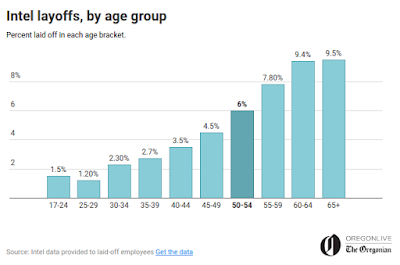 What is behind the growing trend of high tech companies laying off their employees who are 40+ and why are these companies barring such (mostly) highly qualified employees from being rehired? Is there a coincidence in the fact that Intel Corp. is blocking rehiring of employees who were laid off over the last two years? Is there a coincidence in the fact that the OWBPA report issued by Intel Corp. as part of the 2016 layoffs reflects a clear causality between age and being selected for layoff from the company? If we look at the July 2015 layoffs we see a very similar pattern. Coincidence? What is your opinion? Are we going to sit on the sidelines and continue to watch as highly educated and experienced workers see the end to their productive career at the age of 40--all while the average lifespan of people is around 80 years of age? Who is going to support the ranks of the unemployed, while 70-80 million "baby boomers" are marching into retirement age over the next 20 years. 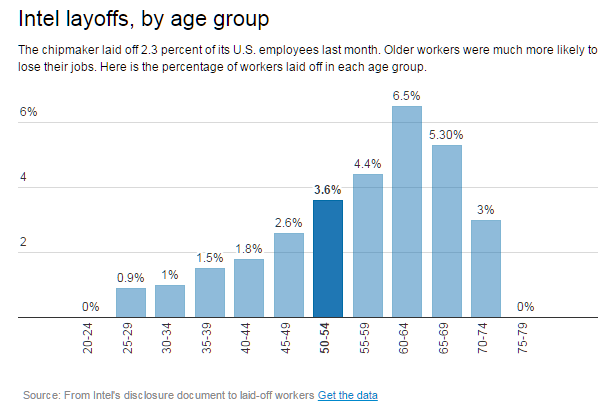 What would the economy look like when payroll taxes can only be collected from 20+ and 30+ year old workers? Why did Intel Corp. receive over 14,000 H1B visas since 2010? Are we going to sit down and watch while corporate management is only concerned about the next quarterly report? Who is going to buy products in a world where 35-50% of the population is unemployed and/or lives on food stamps? As usual, your comments are welcome. Please use the comment link below this article to share your thoughts with us. If you got a letter from SECURIAN, do not throw it away! It is NOT Junk Mail. It is a notice that you have 31 days to continue your Intel Life Insurance coverage, unchanged. That means no medical exams, or other rechecking. Some people use these for Estate Planning too, as a way to pass on money to others without probate. States other than Oregon might also provide Disability Insurance, in addition to the Life Insurances. Seriously, calculate the Life Insurance you need, with what you had outside of your work coverage. And even though you might find these are not the best bargains for you, you can always cancel them later. Although people who have been signing up, have been seeing that continuing with group coverage is often cost competitive. So don't wait to decide. If you threw away your letter, call the phone number listed to get the information again.